There are few things more frustrating than being unable to fall asleep at night, especially when you know you have to get up early the next day. After what feels like forever that you’ve spent tossing and turning, any small amount of sleep you do get won’t be sufficient to energize you for the next day. The problem is, sometimes you just can’t get your brain to relax at night. If you don’t get enough of that precious shut-eye, however, you’ll feel the effects all day long. Your focus will be wobbly, you’ll feel fatigued, and you won’t be at your sharpest. Worse still, all attempts at positive thinking might crash and burn. The good news is that the reason behind your inability to catch those zzz’s might lie in your bedtime habits. By adjusting these routines in order to encourage calmness, serenity, and drowsiness, you’ll be able to beat down that minor insomnia. 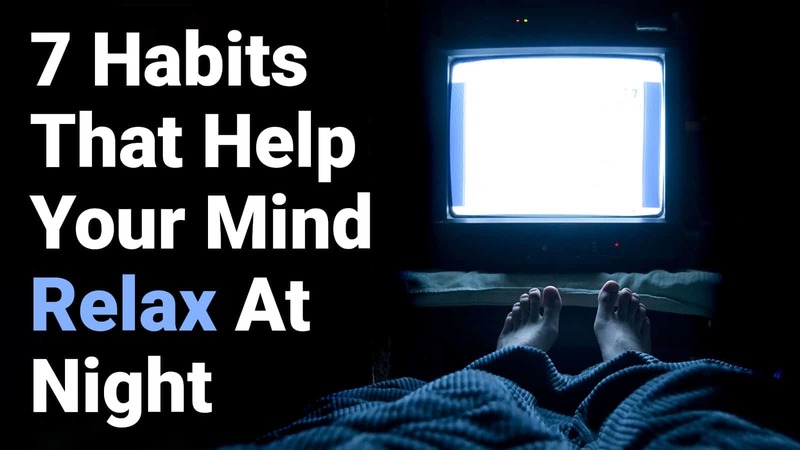 Here are some habits that help your mind relax at night. Steer clear of electronic devices. Light – blue light, especially – can have severe effects on the body’s production of the sleep hormone, melatonin. It can prevent sufficient amounts of this hormone from being produced and can actually greatly reduce the quality of your sleep. Even if you use a blue light filter for your devices, you’re still exposing yourself to lights that restrict melatonin production. Not to mention, you’re looking at a variety of different sounds, videos, and images on those devices (including your TV) that could be stimulating your brain and preventing you from winding down. Your best bet is to put the devices down an hour or two before bed. If you really must do something, listen to soothing music or read a not-too-exciting book. 2. Set up a good bedroom environment. If your bedroom isn’t cozy, chances are you’ll find it difficult to get comfortable enough to relax at night. You don’t realize it, but everything from noise levels and temperature to the arrangement of your furniture and external lighting can affect your ability to fall asleep. What is more, they can even cause long-term problems in health overall. Do your best to minimize external noise and lights in your room at night, keep your sleeping space clean and neat, and make sure the temperature is comfortable for you. You should also, if possible, ensure that your mattress and bedding are all to your liking. 3. Keep a journal or diary. For many people, worries and thoughts can be the reason they wind up staying up, unable to relax at night as their brains whirl with fleeting concerns. Getting this all out in a journal or diary can work wonders in giving you positive peace of mind. Open up a notebook and write out whatever is troubling you, and allow your worry to leave your mind and flood the page. If you don’t feel like writing about your worries, consider getting your to-do list or schedule in order for the following day. It might seem like a stressful experience, but knowing that you have all your ducks in a row can help your mind calm down and allow for a restful sleep. You can also turn this into an exercise in gratitude by writing about what good things happened during the day. It’s up to you! 4. Take a calming bath or shower. Hopping into a hot shower or steeping in a warm bath can help loosen tension in the body. For many, it provides a mild form of therapy to the body, and it can melt a lot of stress away. It’s a great way to help the mind relax. Studies have found relaxing routines like this can really boost sleep quality and encourage faster sleep. Studies have also found that taking a hot bath an hour and a half prior to bedtime will improve your deep sleep quality while allowing for quicker dozing off. If you can’t take a full bath, even just immersing your feet in a hot tub of water will suffice! What you put into your body can change how easy it is for you to fall asleep and how relaxed your mind is. Eating too late at night can have a negative impact on both the production of melatonin and growth hormones, even if being full makes you feel sleepy. It can be bad for sleep quality, too, preventing your brain from fully going into a relaxed mode. Your best option is to allow three hours between your last meal and your bedtime. Also, reduce your fluid intake about an hour before you hit the sack. This will help you be satisfied, but not too full or too hungry – and your mind will thank you! 6. Engage in visualization or meditation. Every night, spend a little time before bed visualizing or meditating. The simplest way to do this is by lying on your back in bed, eyes shut, focusing on the movements of your tummy as you inhale and exhale. When you feel relaxed enough, start visualizing – with the use of all your senses – your favorite place or a calm and serene environment. For example, if you think of a river in the forest, you will visualize the sound of the river running, the smell of the trees, the feel of the running water, and so on. Doing something like this helps your brain relax at night and prepare for sleep. It also helps activate the part of your subconscious brain that is creative and innovative. Who knows, you might just dream up some new ideas! Stretching isn’t just good for the body – it’s great for the mind. Apart from loosening up your joints and muscles, you also release stress and tension when you stretch, which can be great for the brain when you need to sleep. Letting all this stress remain in the body can have bad consequences for mental health, and it definitely isn’t good for your sleeping schedule. Do note that this should be mild stretching only – exercising too close to bedtime can actually make it harder to fall asleep! Stick to calm, relaxed poses and low-impact stretches. No one wants to lie awake in bed, staring at the ceiling and unable to fall asleep no matter how hard they try. By adding these habits into your daily routine, you might just find that this problem becomes a thing of the past. Having a relaxed mind leads to a relaxed body, and in turn, this will help you drift off to sleep as soon as your head hits your pillow!